‘Ekal Nari Shakti Sangathan’ is a platform for single women – widows, divorced, abandoned, with missing husband and un-married women; to raise their awareness, build their confidence, collectively fight against injustice and demand for their rights. ENSS cuts across the lines of religion, caste, class, physical or mental abilities and also extends its arms to women suffering from HIV/AIDS. ENSS was established in 2005 with 105 members and now it has more than 12,000 members. The programme is empowering single women in 396 Panchayats spread across 21 development blocks in 7 districts of Himachal Pradesh and is spreading to other blocks and districts. 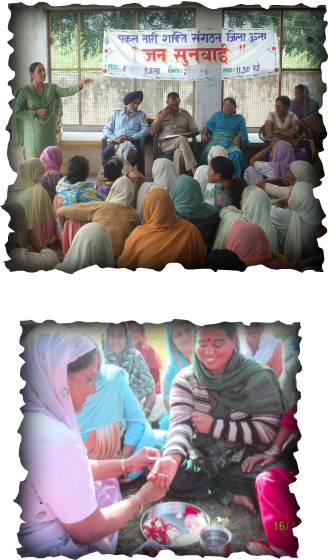 In addition to the State level activities, ENSS- Himachal Pradesh is also an active member of the national level single women’s organization- National Forum for Single Women’s Rights. It is also providing support for development of ENSS in Punjab. Over a period, members of ENSS have done tremendous work; because of their relentless advocacy and struggle, Single Women have become an agenda for all the political parties in Himachal Pradesh. The Himachal Pradesh Govt. has awarded leaders from ENSS at the block, district and state level on Internation Women's day 2014. An innovative intervention by the ENSS has done is to initiate Block/District level Jan Sunvais (public hearings). These are turning out to be Problem Solving Clinics where single women put up their problems –mainly procedural whilst procuring income certificates or making applications for various support programs that are run by State Government and the SDM/DC provide the solutions on the spot or issue directions to the concerned officials. The other set of problems faced by single women are related to the people from their neighbourhood, after hearing the ‘problem’ the SDM/DCs issue orders to the concerned Babus or Police to take action. The main advantage of these Jan Sunvais is that women are developing courage and learning to articulate their problems correctly and we consider this is the first step towards `standing up’ against the hostile neighbourhood people or local Babus. The support from sister organizations is commendable. Apart from this, the local press has always been very supportive and large numbers of news clippings that have appeared, proves this. Now majority of ENSS at district level are acquiring their independent legal entity. The State level ENSS is a registered body and ENSS are also being registered at the district level. Thus, their march towards carving out independent legal identity is on. The ENSS conducts one day awareness camps is to orient the single women in the area about the Sangathan and its activities as well as motivate them to become a part of this collective movement. Leadership Development training is provided to panchayat level members who take keen interest in the activities and have the potential for becoming future leaders. The festival of ‘Behna Teej’ is celebrated by ENSS members since the last four years. This festival is a symbol of sisterhood amongst the Sangathan members and is rejoiced by singing songs, distributing sweets and marking each other’s foreheads with tilak. The spirit of the festival lies in the assurance that even though the single woman is marginalized by her own family and society the Sangathan stands in strongly in her support. The media has also featured the festival and the changes it hopes to inspire in various news articles. # Director of the Department of Women and Child Development, Himachal Pradesh requested the support of ENSS in probing the causes of missing girls in Himachal Pradesh. There has been an increase in the number of girls disappearing from schools and the Department has submitted a proposal to the Central Government for a grant to study the causes for disappearance of girls. A proposal has already been submitted to the Department in this regard. # Gram Panchayat Salani Katola, Nahan Block utilized the award money from Nirmal Award to provide financial support to a single woman with 4 daughters. The woman was gifted a fixed deposit in the name of her daughters. # 27 single women from Gagret development block approached and received support funds towards their medical expenses from the Village Health Sanitation Committees formed in their respective gram panchayats. # Chief Minister Kanyadan Yojna grant increased from Rs. 21,000 to Rs. 25,000 and income limit for availing the benefit of this scheme has been increased from Rs 20,000 to Rs 35,000. # Ration cards are being issued to women in female headed households. # State government has issued orders to Ration depots to give priority to single women. # Starting 2014, Social security pension increased from Rs. 500 to Rs. 550 per month and pension for the handicapped fixed at Rs. 750 per month while pension for the elderly fixed at Rs. 1000. At the National Level, ENSS from Rajasthan, Bihar, Jharkhand and Himachal are getting together and they are trying to rope in Maharashtra and Punjab. · A new concept of all-single women headed households was introduced and put into practice in the 2011 census.